Our example analysis seeks to discover whether paying a dividend increases firm value. Conduct a linear regression analysis. This is easily done in Excel (see e.g. Regression Analysis in Excel). Are we done? Or perhaps a single-factor regression may not be telling the whole story. 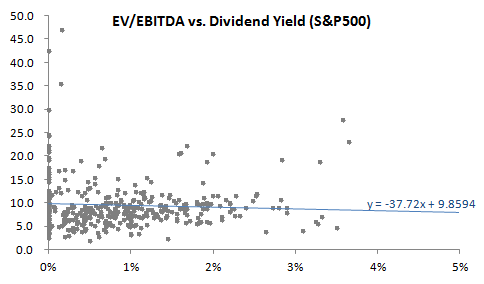 Our intuition suggests that dividend-paying firms are also larger and more stable. Perhaps our first regression model should be adjusted to take into account firm size. To do that we need to another regressor. We want to add a proxy for firm size; let’s use operating earnings (EBITDA), or more specifically, the log of EBITDA. Notice that dividends are now positively associated with firm value (though with a p-value of 0.9, we suspect there is no relationship at all). This means that indeed our first model wasn’t telling the whole story. Takeaway: Regression analysis benefits greatly when regressors are orthogonal; in finance they almost never are. As it turns out, our two regressors above have a pairwise correlation of +0.24. 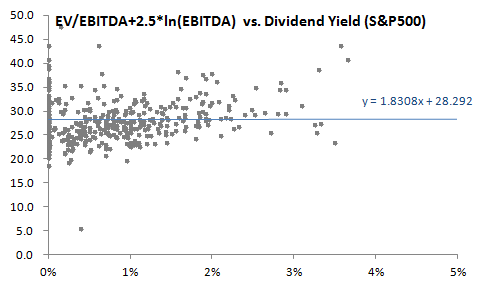 This explains why adding the ln(EBITDA) regressor changes the coefficient of the Div Yield term in the model. In finance, all regression models are wrong, but some are useful. Regression analysis requires several assumptions. Incorrect selection of regressors is the most common problem with these analyses. Including or excluding a regressor can change the coefficients found for all other regressors. Thus the utility of most regression models for prediction purposes is questionable. Conversely, one can derive almost any desired conclusion from a regression analysis through careful selection of regressors. Caveat client. If regression analysis can fail us in so many ways, how else can we predict the result of corporate finance changes? Here are a few other technologies to consider. Case study examines a similar firm to see how it was affected by the change. Though rarely providing the best answer immediately, the technique is more valuable for the discussion and brainstorming it can engender. For example, find similar companies that changed dividend levels and study the market reaction. Surveys should represent a thoughtful investigation of the question at hand by studying common practice. They can often lead directly to descriptive theories of behavior. Find an expert and ask her the answer. If expertise is lacking, hire a professional (such as a trained statistician) to analyze the problem.